Buy a pack of three and save on each tube. Give one to a family member, give another to a friend or keep them all for your own pleasure! Ruby’s Body Balm is an ALL NATURAL lubricating balm with 5 simple ingredients: olive oil, lemongrass, calendula, beeswax and benzoin. It is made to ease friction and the chafing common to swimmers, cyclists and runners. 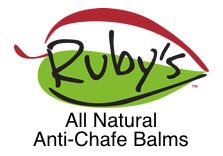 Ruby’s can also moisturize dry feet and elbows, protect a baby’s bottom, massage muscles or enhance a romantic evening. Try it and find out why Ruby’s Body Balm, “MOTION POTION FOR EVERY NOTION™” is naturally better. Recommendations: Start with less, enjoy more as needed. Separation is normal, squeeze tube to blend. Use hot soapy water to remove from fabric and body. Reapply to chafed areas after showering. Store at room temperature. Do NOT use with latex condoms. Chris McDonald Ironman Champion uses Ruby's Lube for 4 things!